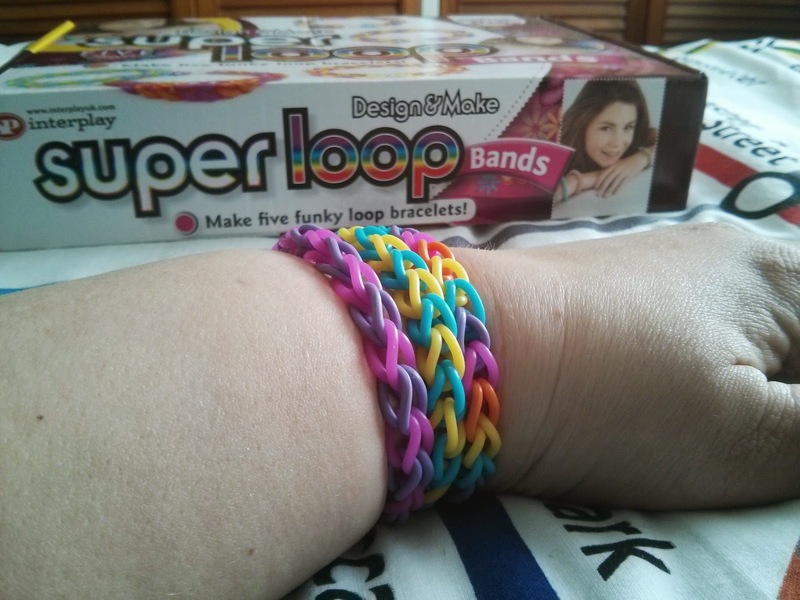 When the Cra-z-loom craze was just starting in the States, several of the Youtubers that Top Ender follows were talking about the bands and the bracelets that they were creating, I knew that when Top Ender would get hold of one of the looms herself that we'd lose her to a life of making bracelets for herself and her friends. 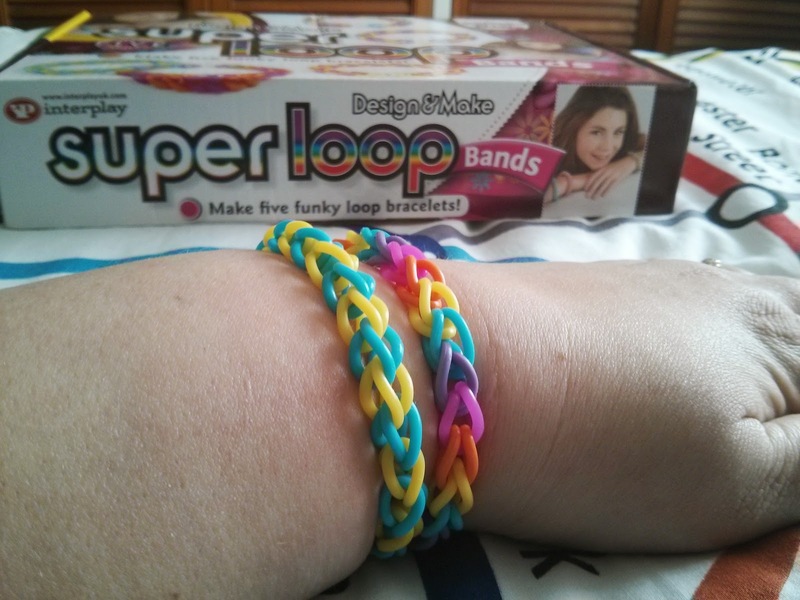 When we got a Character Cra-z-loom Bracelet Maker Top Ender is the sort of girl who loves to see what you need to do along with the instructions, so she got me to sit down with her to make the first bracelet so she'd be able to replicate what I'd done. 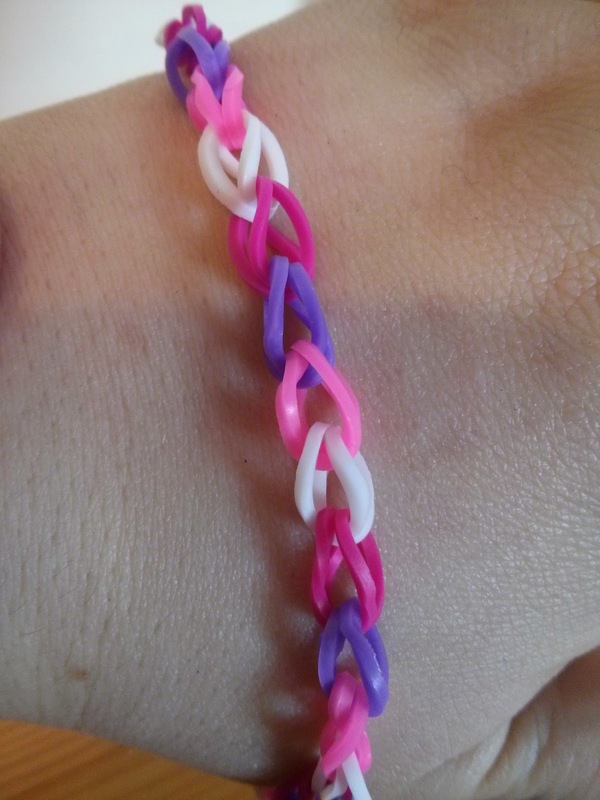 The first bracelet that we made together was a simple single band bracelet, nice and easy and fairly quick to make. 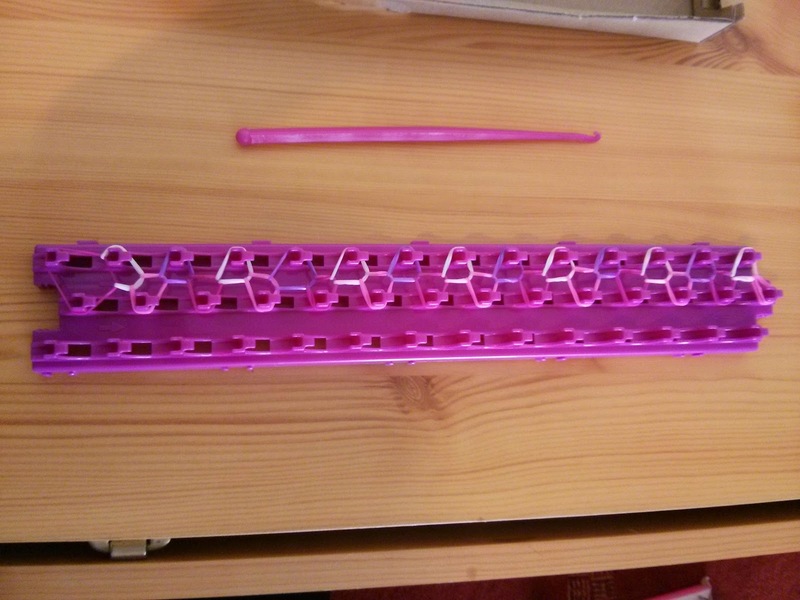 The only problem was, the bracelet was far too long for either Top Ender or I, so we reduced the length of the next bracelet. After this second bracelet, Top Ender disappeared upstairs with a table and the bands and several bracelets later she came back downstairs. Top Ender has now started watching videos on Youtube to follow directions on how to make ever more complicated looking bracelets. 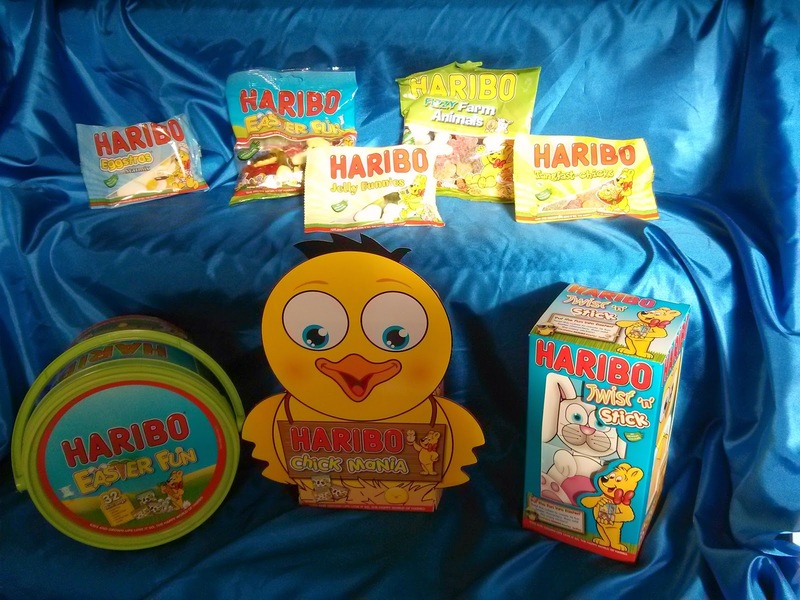 The set has an RRP of £14.99 and is a brilliant buy for girls who love crafting, especially this Easter. We were sent the Character Cra-z-loom set to review. A couple of weeks ago, whilst I was at School helping Big Boy with his lunchtime Insulin, there was a little girl in the medical room who was going home due to an earache. The little girl was sobbing her heart out, and Big Boy was trying to calm her down, as he's a compassionate sort and can't stand to hear any child cry. Big Boy had a low blood sugar and so whilst we were waiting for his levels to rise I talked with both Big Boy and this little girl. Today as I was leaving the School, after having given Big Boy his lunchtime Insulin, the young girl ran up to me on the playground. She let me know that she was back at School and that her earache had all gone now. I told her I'd been worried about her and was really pleased that she'd got better. The little girl had been smiling at me since running up to me, but suddenly she turned serious and looked me straight in the eye. I looked to the lunchtime supervisor who had been standing next to me and she looked back just as amused/confused as I was at this little threatening sounding motivational message. I kept thinking about what this little girl had told me for the rest of the afternoon. Why had she felt she needed to tell me to never give up? Had she been directed by some greater force (Yes, I mean God) to give me a message? Was it so obvious to her that I'm a continual quitter? Was she planning for a career as a motivational guru? Was she Rickrolling me?! I decided in the end that it was a message to me from God. 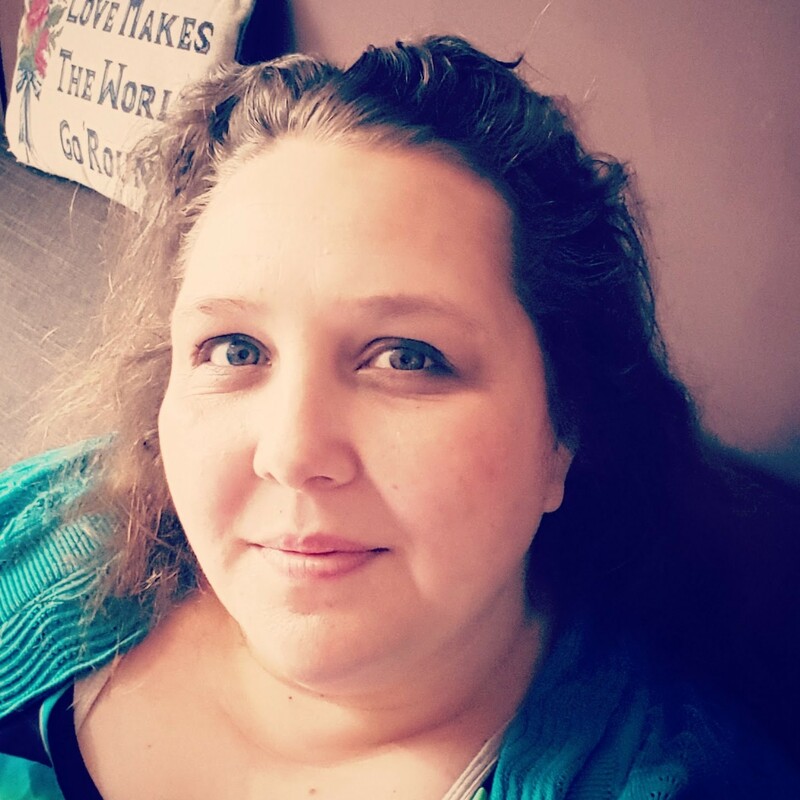 It made sense to me that a loving Heavenly Father would send me a message telling me not to give up especially after the whole "Do I or don't I give up the blog?" thing. What do you think? If a four year old girl told you to never give up, would you pass it off as a child having heard it and repeating it or would you read a deeper message into it? Sometimes when Top Ender gets into a new hobby I start to feel a little bit jealous. It's not because she isn't spending time with me, or because I want to be her, but she creates such fantastic pieces that I want to be able to create wonderful pieces too. 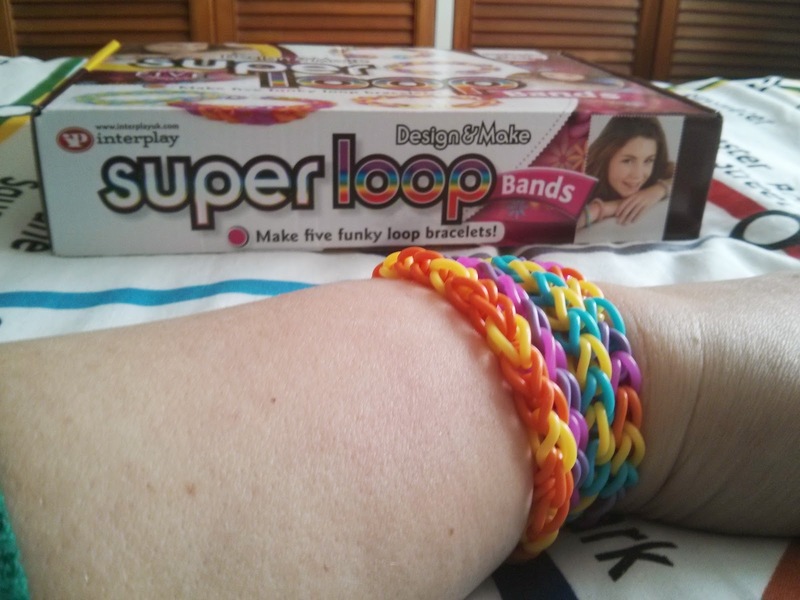 When Top Ender was sent some Super Loop Bands by Interplay to review, I figured I wouldn't let Top Ender have all the fun, and decided that I wanted to create a bracelet too. 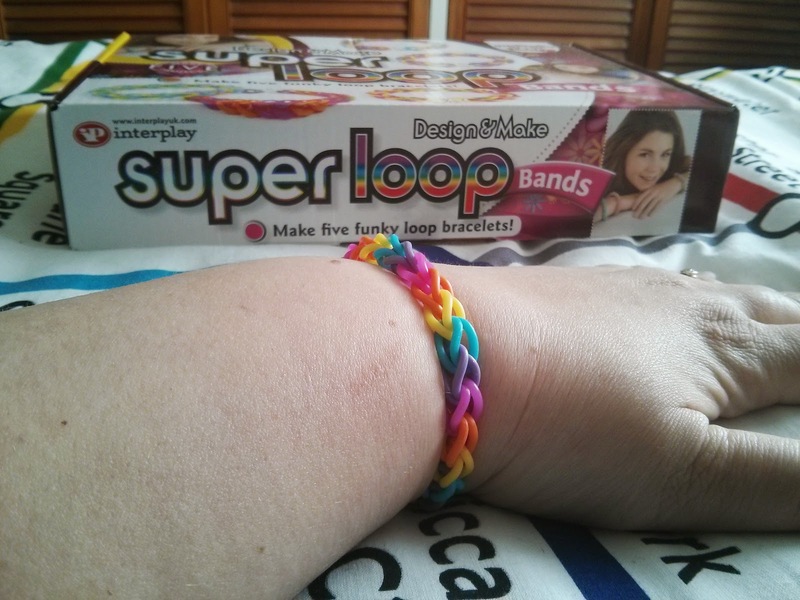 So before I handed the box to Top Ender, I sat watching one of my TV shows and made a bracelet. It was so fun, that I made another one. In fact before my TV show was even half way through I had created all the bracelets. Luckily Top Ender didn't mind that I had completed them all and she was just pleased to have the bracelets to add to her jewellery collection. Well, apart from the one I was keeping for me that is! 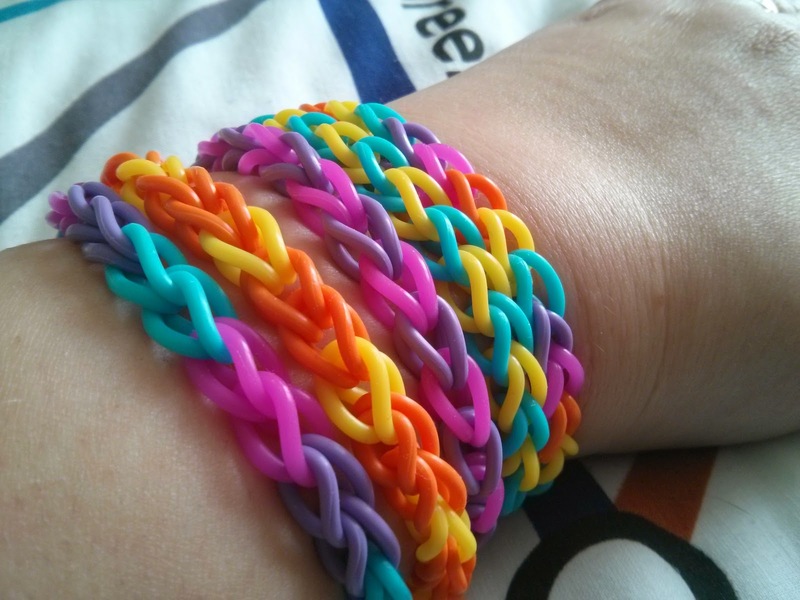 The bands were really easy to make, and unlike the loom bands, don't require a loom to make them on, you simply fold the loops and link them together. They have an RRP of £9.99 which is what I think a low price for something that is quite durable and will be able to be taken apart and reused in the future, if Top Ender decides she didn't like my colour patterns or designs. 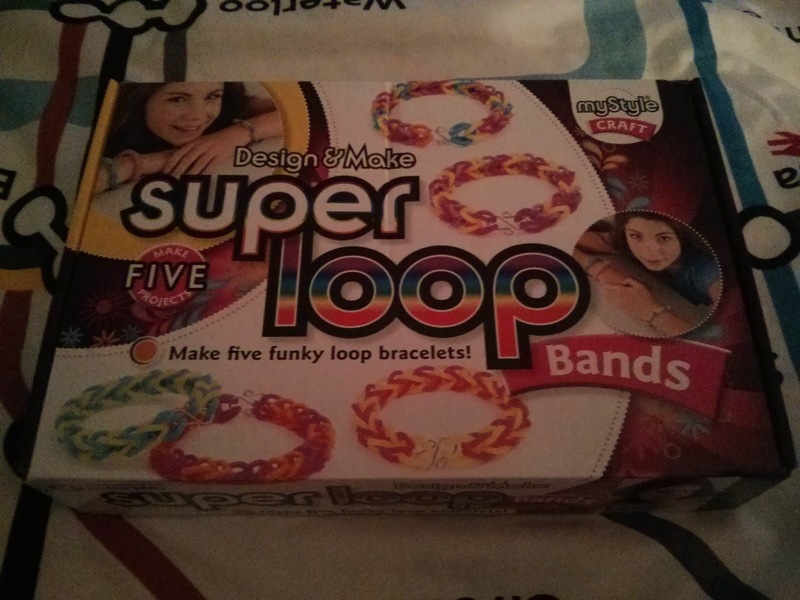 We were sent the Super Loop bands to review. I'm a TV addict. I know, nothing you weren't already aware of from my tweets talking about various TV shows I'm watching or that I am a fan of. The problem that I have however is that my current set up of a subscription based Satellite service is rather expensive and so Daddy and I have been talking about how we can still get great TV shows, still get a range of TV channels and at the same time how we can save money on what we're paying out. I had an idea that youview, might be the answer and was looking into the service when I was asked if I'd review the service. 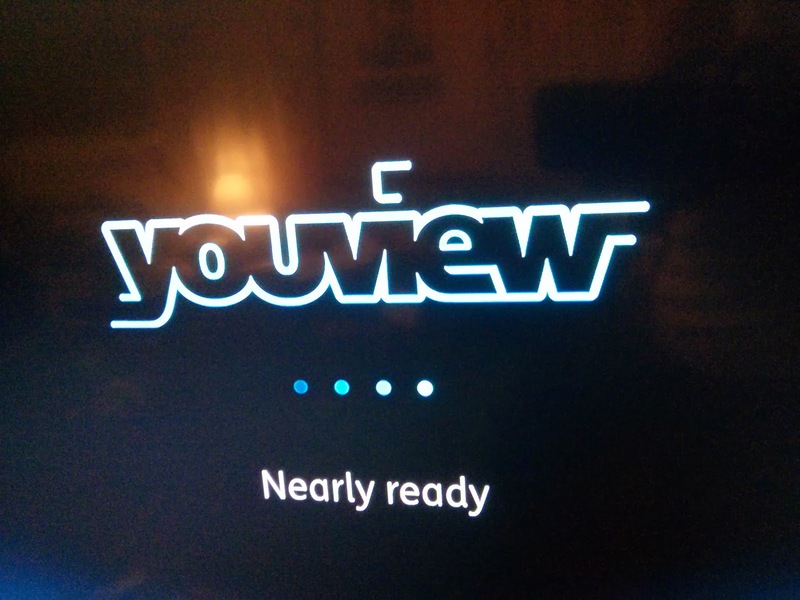 I figured that I could review the youview service and work out if it was what I wanted to swap to all in one go and so signed up to be considered. I got lucky and was chosen. When the box arrived, I decided that I would set the system up myself. Daddy wasn't around, being in Birmingham and so I didn't have any back up. I was a little nervous, but I read the instructions and worked out which wires went where and had the system up and running before I knew it. Big Boy was discussing what was for dinner. 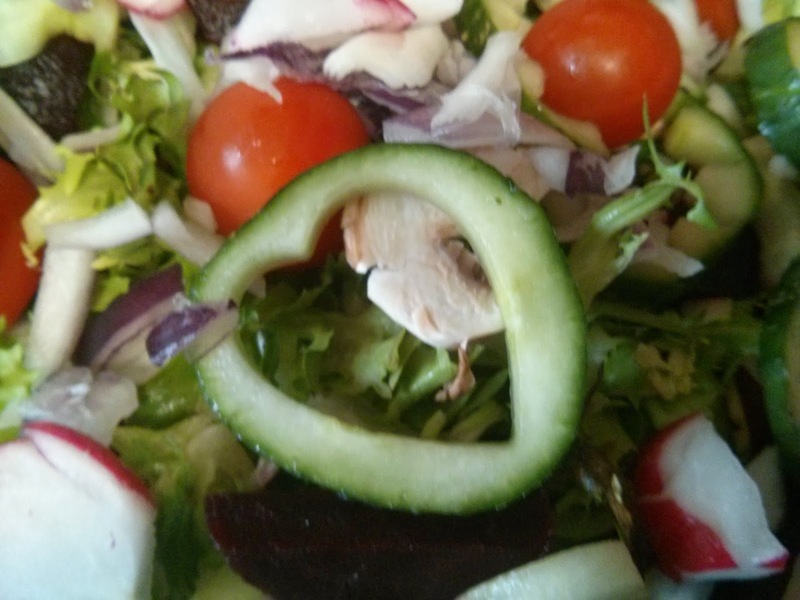 He'd decided he didn't want what was on offer and so had taken himself to the fridge to work out what he did want. 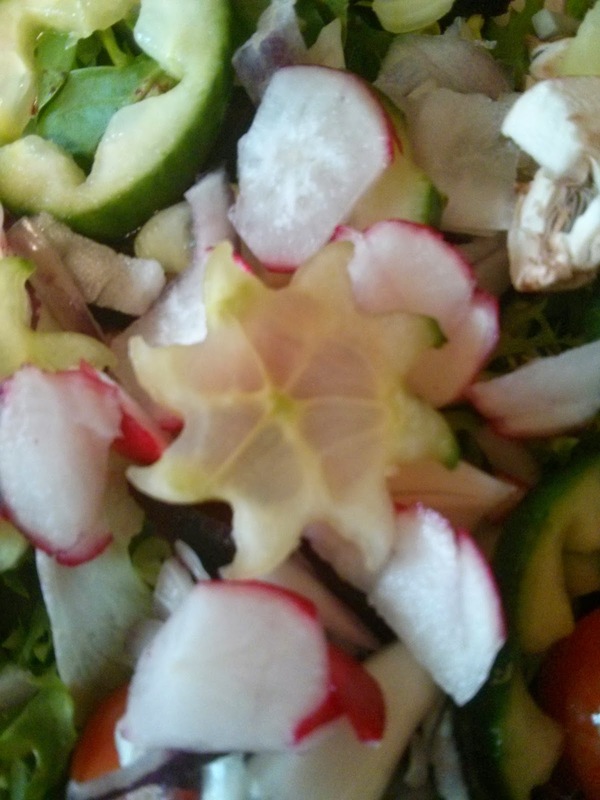 I went to the fridge and looked inside. There on one of the shelves stood the ingredients for my Bolognese, tomatoes, celery, onion, mushrooms and a few other bits and pieces. There was even mince and balanced on top two eggs. I was now even more confused. Firstly how did Big Boy know what went in my Bolognese recipe. Did he want Bolognese with an egg on the side? Did he want the sauce without the mince and boiled eggs chopped up in the sauce? "Big Boy" I called "How do you want the eggs served mate?" "Hmmm. Like yesterday lunchtime, have we got any of those rolls you put the Bolognese in left?" It was here that it clicked what he was after. "Big Boy, Egg MAYONNAISE not Bolognese!" One Egg Bolognese and sausage sandwich later and BB was quite happy. Anyone who has read my Twitter or Facebook, or even this here blog for longer than five minutes knows that I'm fat. It's okay, I get to say it because it's true. You however, don't get to call me fat. I try to be healthy. I'm not pretending that I know everything, I'm not pretending that I'm perfect. Yes, we eat 50/50 bread, but at least it isn't white. I drink Skimmed Milk, I drink fizzy pop (but not as much as I used to and my children don't), I drink water or squash (mainly water and it's the same for the children) and I try to make sure we have at least five portions of fruit and vegetables a day and it's normally closer to ten. I don't drink Alcohol (it's a Mormon thing), I try to exercise as often as I can (even if it does make me look stupid) and for at least 90 minutes a day and I do it all with a smile on my face. Apart from in this one picture below where I look like I've had an "accident". I'm trying to set a good example to my children, I'm trying to make sure that they know that being fat isn't good, that they shouldn't eat sweets often (we try to limit sweets to parties and when Big Boy is having a low blood sugar episode), that they need to eat healthily, that they need to exercise and in general all the things that my parents taught me that I didn't listen to. Maybe they should have used a sledge hammer. 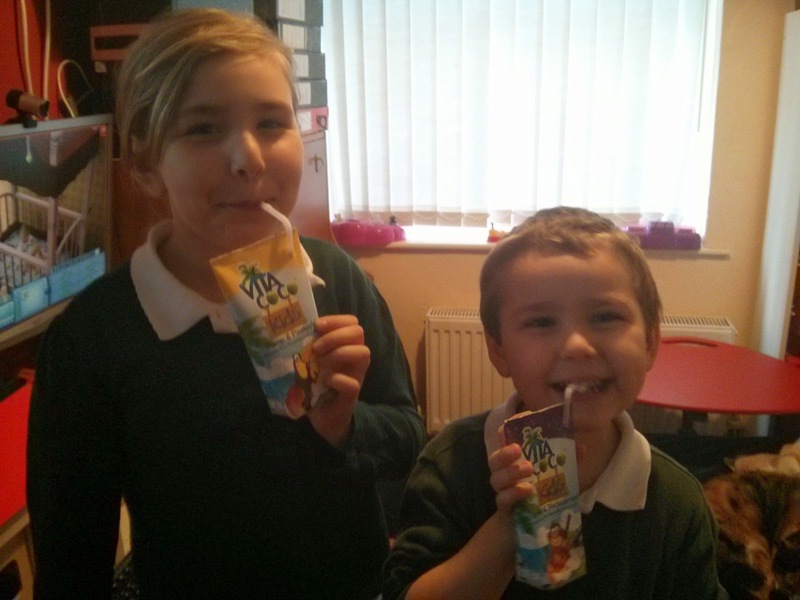 As part of our healthy living plan I like to get the children drinking things which are healthy, or rather things which are not unhealthy! We don't drink shop brought smoothies all that often (too much sugar), they don't drink carbonated drinks (I'm addicted so I don't want them to be) and if they drink fruit juices then it's diluted down, as BB has already had to have teeth removed (although I think that was Diabetes related). 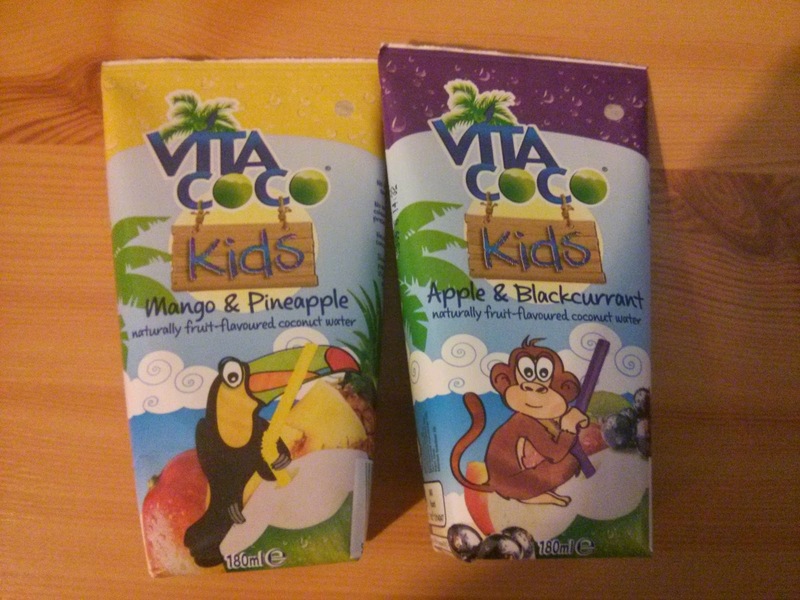 When some samples of Vita Coco Kids arrived, I thought that the kids were going to refuse to drink it. They've had coconut water before and decided that it tasted rather foul (they said it tasted like babies vomit), so after a particularly long walk (well it was coming home from School the long way) I thought I'd risk giving it to them. After all they needed to be rehydrated and it does say on the packet that it's good at that! The little sods angels drank it. I mean seriously, how am I supposed to keep up with these two when they change their minds on what they do and don't like every two minutes?! If you'd like to know more about the drinks, then take a look at the website but my two say that you should at least try something new as you might find out that you like it and that it's available in Waitrose, Sainsbury's, Amazon now, it will be available at the end of March in Holland and Barrett and in Tesco and Yo Sushi from the end of April. I was sent some juice to review. The straws were weird as they bent in two places. If you're reading this anywhere other than on www.amothersramblings.com, then you'll be pleased to know that you're reading stolen content. And it's not just my content that's stolen. See that link to another Mom or Parenting article? Yeah, that's stolen content too. See that link to a beauty article? Stolen! The news section is fine though right? Actually no, that's stolen too. Well if you've enjoyed reading my posts you can go to my blog, I write a lot of rubbish, but it's my rubbish and I get paid money for the adverts on my blog. 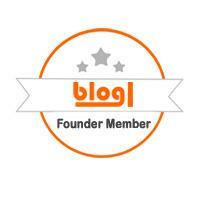 The posts of mine you've read here? The idiots who've stolen my content get paid for the adverts you see here. Oh and did I mention if you read my blog on my website, you get to see even better pictures than this one of me and the children eating invisible spaghetti? I normally schedule myself some time on a Friday to go through the plans for the next week and work out what kind of meals we need. I base it on the weather, on our plans, who is in on the particular night, what we've not had for a while, what we've got in the freezer and more times than not what I fancy to eat myself, which if you follow me on Instagram, or Twitter or see my personal Facebook feed, then you'll know that it's a salad! This week is no different, I'm having Salad for lunch everyday and apart from Monday night when Daddy isn't here I'm preparing meals for the whole family every night. The steamer makes the best curries, and as they are Daddy's favourite meal we're eating them every Saturday night. 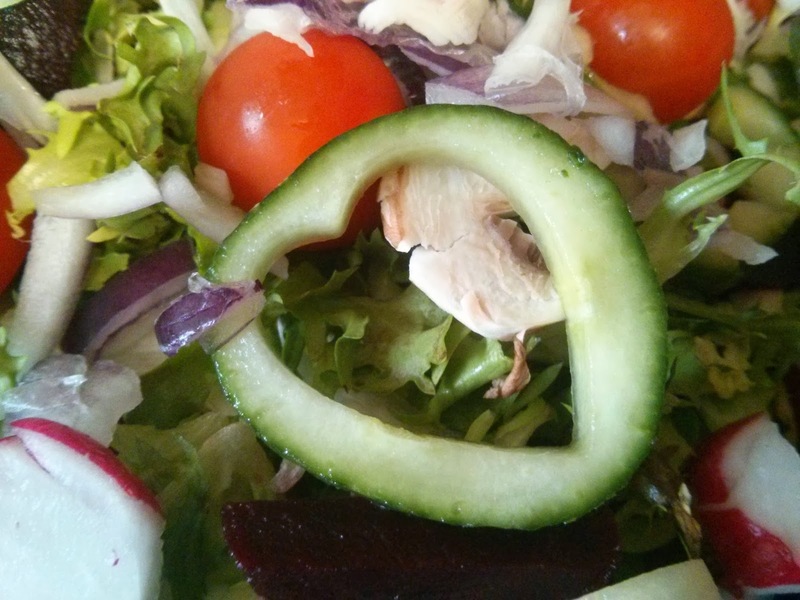 It's nice because it's healthier and quicker than a takeaway (okay so maybe not quicker) and it's cheaper. 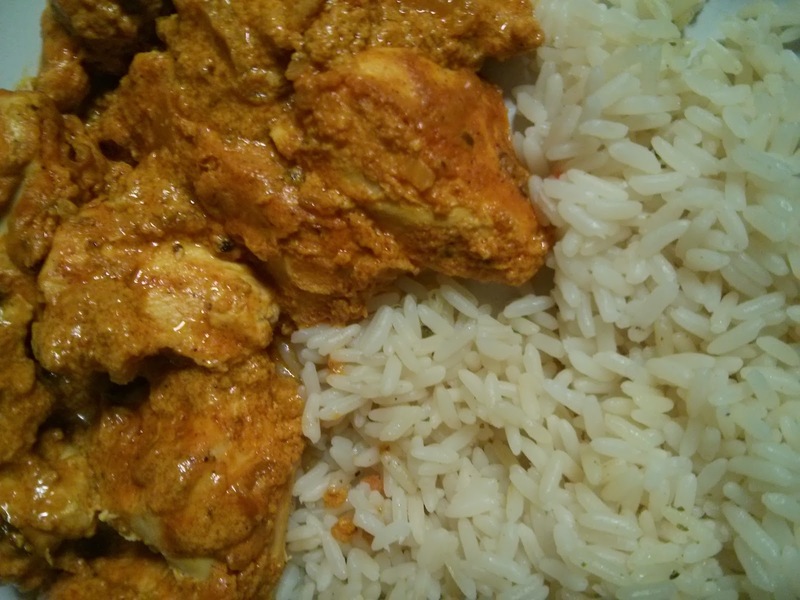 Plus we had a chinese stir fry last week (my favourite) so we had to have a curry again this week! We didn't get our Chicken on Thursday night (it's a long story, but lets just say I was proved right shall we!) and so I'm putting a roast chicken on the menu today. We're eating our roast in the evening now, as with Big Boy being able to have his insulin on a multi-wave function (it gives a bit at the start of the meal and the rest spread out over a time we decide) we don't have to worry about highs several hours after the meal. Plus it's a munch and mingle at Church, so we wouldn't be back in time for a roast anyway! I still have soup in the freezer from my brilliant soup maker, I made some roasted pepper and mediterranean vegetables last week from leftovers and the small but I tasted was LUSH. So we'll have that with cheese toasties before Top Ender vanishes off to Brownies. 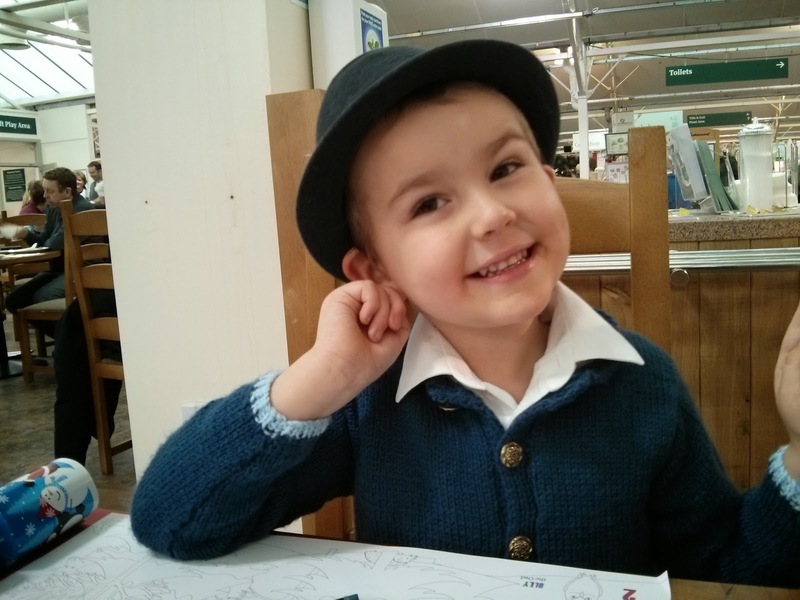 Big Boy has asked for a veggie pasta dish, but then asked if I could add fish. I'm going to have to think about this one! I think he has remembered a bento I did for him, where I turned an egg into a fish, but I'm not sure so we'll go through pictures of food I've made for him to work out what he wants. I'm taking a risk and making sardines on toast for the children for their meal tonight. There will also be other toast dishes (mushrooms on toast or tomatoes on toast or pizza toast!) so that they will eat, but I figure it's a good way to get them to try something new. Daddy has today off again (I know he's making Thursdays off a habit) so we're going to have fajitas as a family. 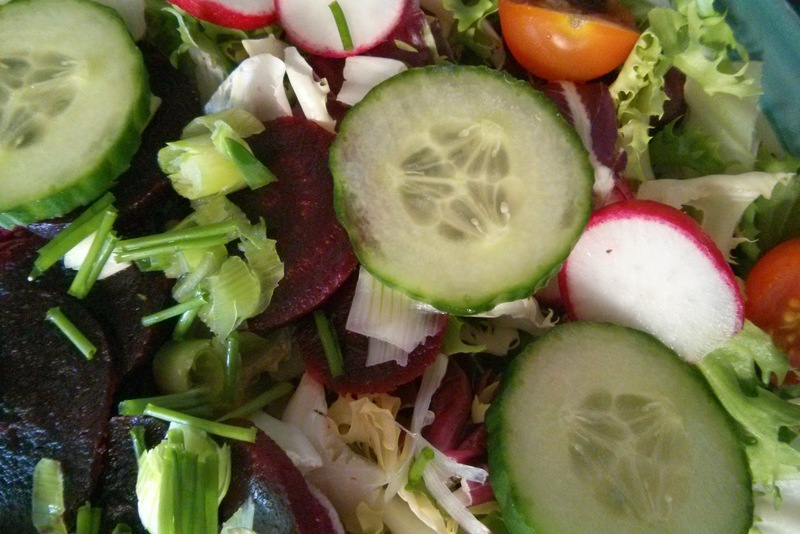 Hopefully the weather will dramatically improve over the week so that we can eat in the garden. This will be served in two sittings, so that Daddy can eat when he gets home. Hopefully it won't be too late so I can eat with him, but I have a feeling it's going to be a late one. 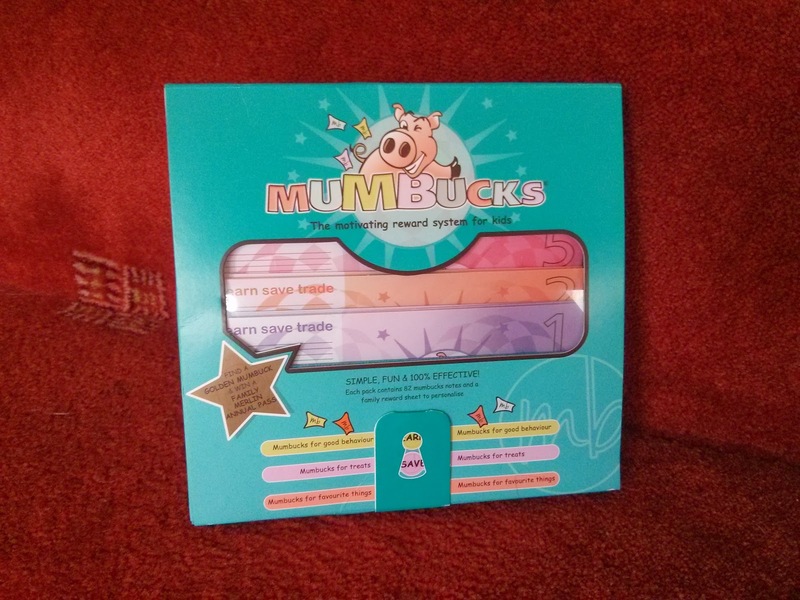 A couple of weeks ago I was asked if I'd like to try out a reward system for children that is based around currency. The idea is that the Mumbucks are earned for good behaviour (which you pick either as a family or as the supreme leader of your household), saved for special treats (the children have decided McDonalds, video games and theme parks count here) or traded for extra time on the consoles or TV time etc. I thought this sounded like a great idea and agreed to a review and giveaway! 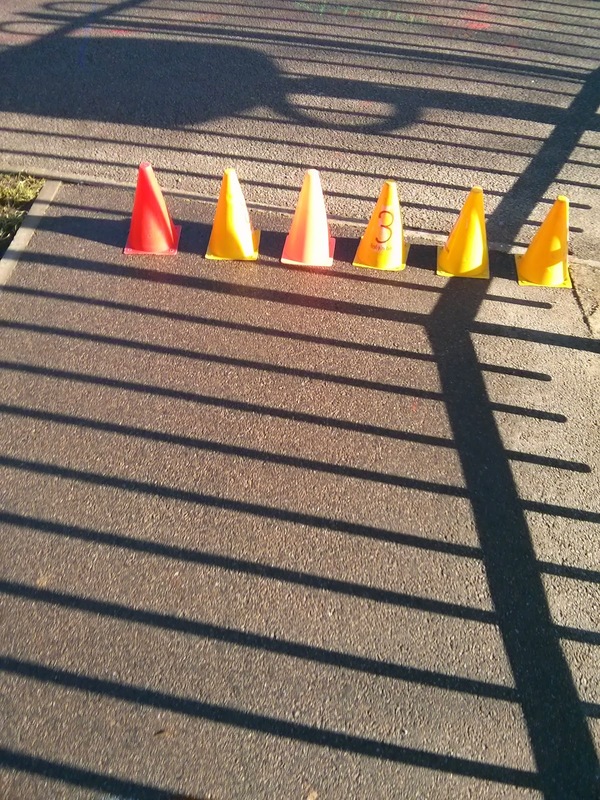 We don't really have a problem with misbehaviour in our household, but I thought that this system would be fun and an added encouragement to the children to carry out the small amount of chores that they are currently tasked with. 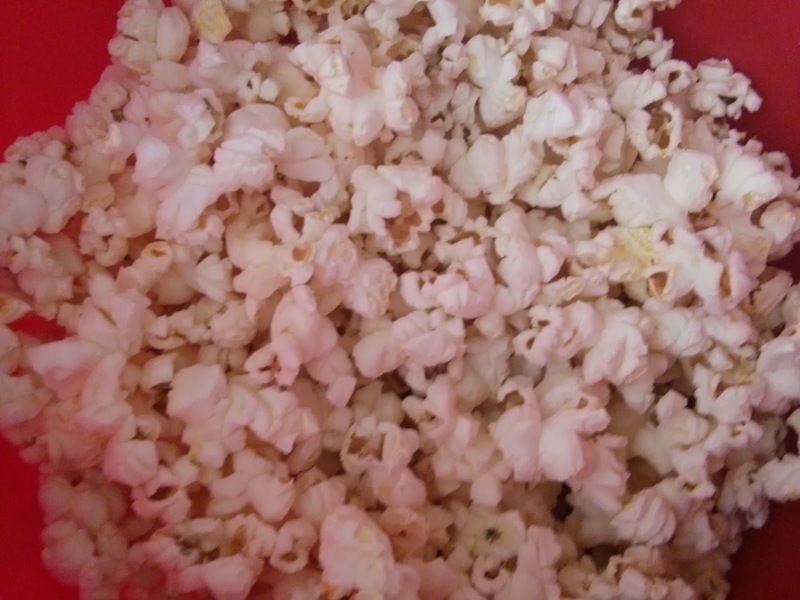 As soon as Big Boy saw the packet, he was asking questions about what it was and after reading the packet and the leaflet he was eager to get this system in place in our home. We waited until Daddy was home though, so that we could all work together to agree what the rewards would be and what our expectations were in order to earn the Mumbucks. We were discussing small things like taking things up that were on the stairs, when Big Boy excused himself. We thought he had gone to the toilet, but when he reappeared a few minutes later he declared that he had been and taken everything that was on the stairs up to the relevant bedrooms and whilst he was there had made our beds for us, so could he please have his Mumbucks now. The reward system is working well, Top Ender is saving her Mumbucks up to swap for a special treat in the future (or possibly cash) and Big Boy is saving his to trade for extra time on the consoles on School nights. Our family is working even better than ever, and we're loving that! If you'd like to win a pack of Mumbucks for your family, simply follow the instructions in the widget below! If you have any other tips, for a well running family, let me know in the comments too! We were given a pack to review. The meals for this week seem to have been planned for ages, although I think its just because I've been thinking a lot about food recently! I've decided to make Saturday our curry night. 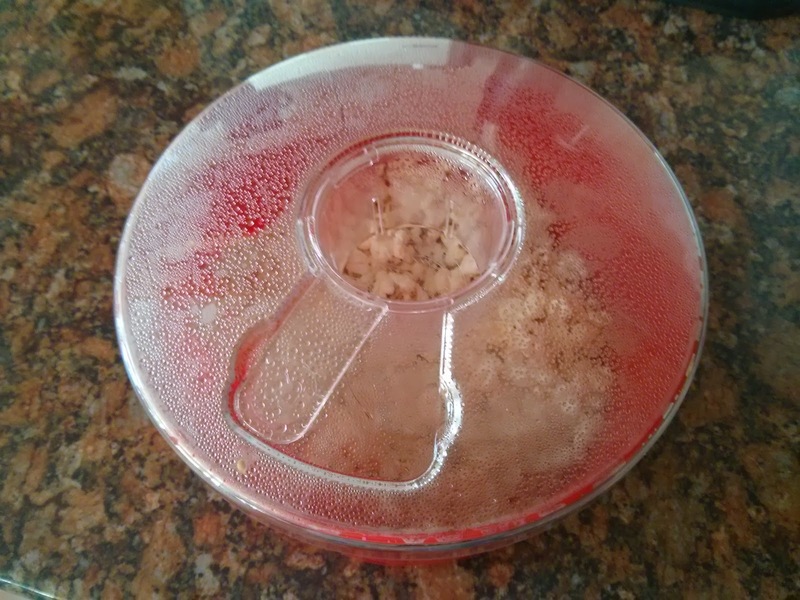 The curry that Daddy made in the steamer last Saturday was so lovely that it needs to be repeated, many many times. We have the missionaries over for dinner today, one of the great things about this is they eat just about anything and another is that they are always so pleased to be invited! We're looking forward to getting to know these two young men and also to share some learning with them. The children love quiche, so a wedge of quiche and new potatoes and some form of veg will be a great meal. 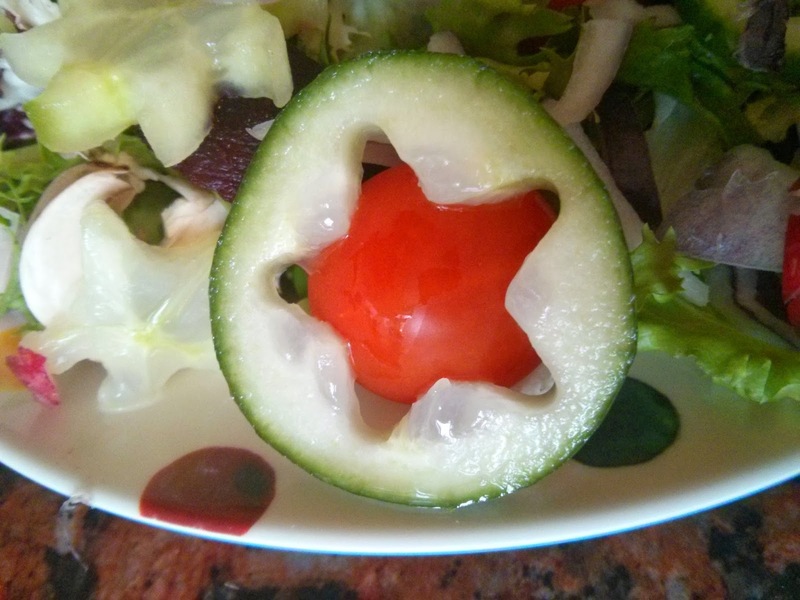 I'll have salad instead of potato. I was thinking about having pizza tonight and getting the children to make it, but in the end I decided that a chicken breast burger was the best idea. 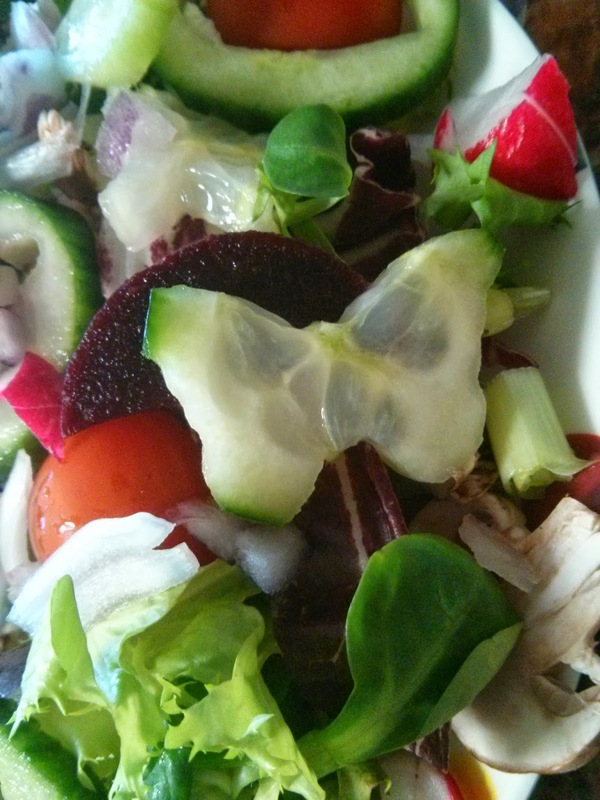 We're having it with home made wedges and either a home made coleslaw or corn on the cob. We had Salmon last week and everyone was happy (mainly because we all love Salmon) so we're having it again tonight. I'm not sure how I'm serving it or even what with so until Wednesday I'll wing it! The children are asking for Gnocchi yet again, but I think a different type of pasta is needed! 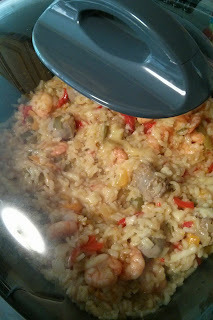 My steamer hasn't replaced my lovely Morphy Richards Intellichef Multicooker, and just to prove it tonight we have my version of Paella made in it. I think I'm looking forward to this meal most! 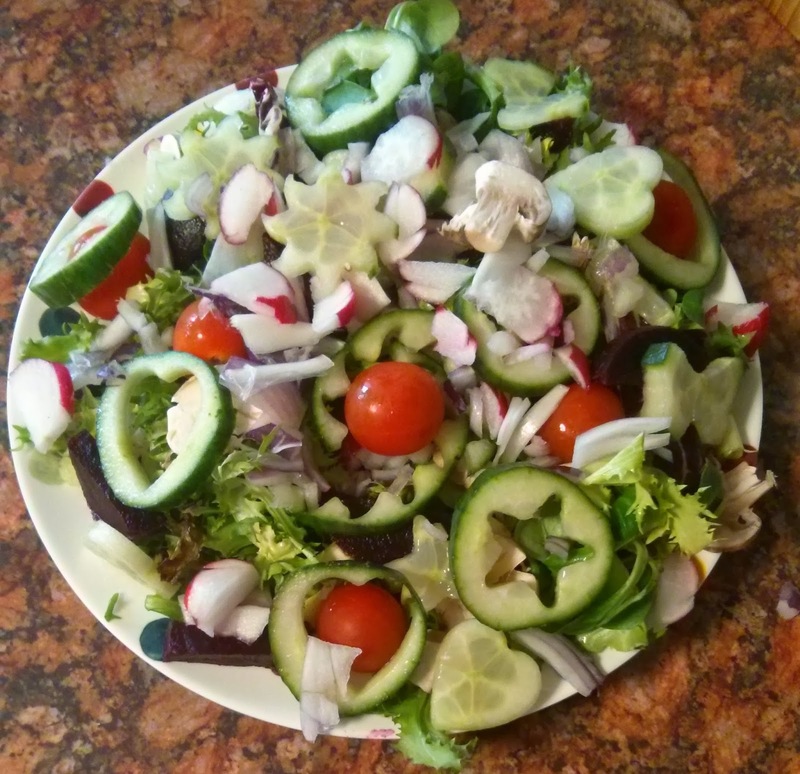 I think that this is a good week of food, what about you? Are you having anything good that I need to add to my plan next week or are you borrowing from my plan? Earlier this week the photo prompt for the Fat Mum Slim photoaday was "My Name is..." and I shared this photograph and message. Well, because that picture is of me. It and the words below it (My #name is Pippa Dawn, I go by PippaD. 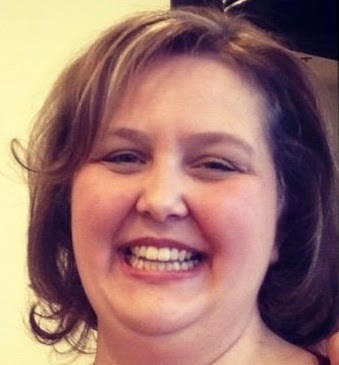 I am a wife, a mother, a daughter, a sister, an aunt, a cousin, a friend and hopefully an inspiration. #FMSPhotoaday) sums me up. I'm all bingo wings and large thighs and a huge belly, because yes that is what I see when I look at that photo. HOWEVER. You know what? That's fine with me. I mean obviously I wish I didn't have bingo wings, large thighs or a huge belly but look at the important part of that picture. Look at me smile. Look at me throw my arms in the air with what looks like carefree abandonment. When this photo was taken I was with my family, at a place I love. I think you can see that in the photograph in my stance and smile. When this picture was taken I wasn't thinking, "That'll be a great photo to share with the world" (seriously, I'm in my swimming costume do you think I'd normally share a photo of me in my swimming costume?! ), I was most likely thinking "Hey Husband look at me, I'm going for a swim in the sea!". The thing that has got me though, is in the last week I've had DM's, PM's, emails and text messages from friends, families and people who read this blog telling me how brave I am to put this photo up. I'm not brave. It's a picture of me. Yes, I'm overweight, but if I waited until I was skinny or met the standards of beauty that society seem to set these days then there would never be a photograph of me taken. I am me. I am overweight. I am funny. I am loved. I am Pippa. 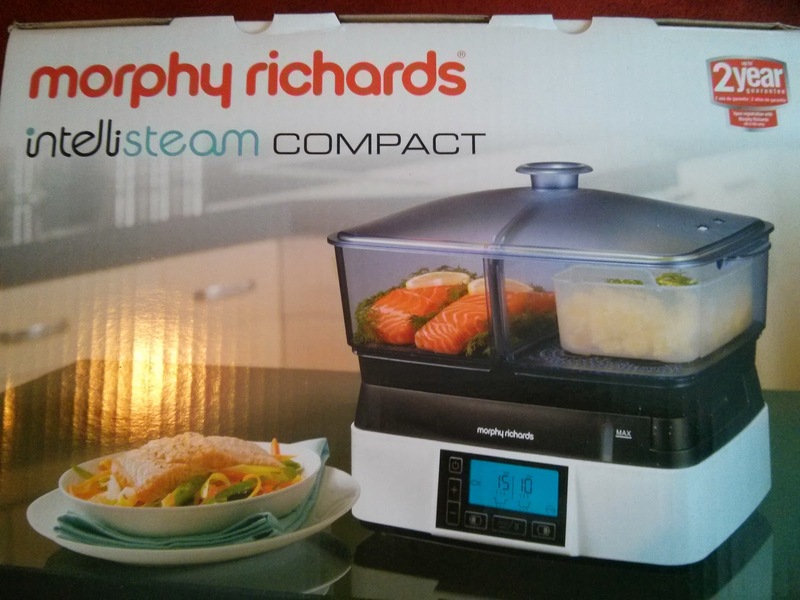 I've got a new toy to play with this week, I've just taken delivery of a Morphy Richards intellisteam compact, (look out for my review and giveaway in the next couple of weeks) and so I'm planning a lot of steamed meals this week... it's a throw back to when I was first married! I read the suggested meals in the booklet accompanying the Morphy Richards Intellisteam Compact out to Daddy and he decided that this is what he would like the best out of all the suggestions. Luckily for him I agreed! Don't tell the children though, as they're having chicken and noodles as I figured it was easier than getting them to eat curry twice in one week! It's going to be a much welcomed return to the sausage roast. I'm looking forward to the gluten free Yorkshire Puddings (I need to get that recipe up on the blog soon) and I must remember to get Daddy to make this a little late as my good news tomorrow may take some time! Top Ender and Big Boy love Macaroni Cheese, just not my version. So I thought I'd really annoy them by throwing in some cauliflower too this time. I'll post a recipe later this week. Daddy brought me some Prawns from M&S the other day, technically they were his but I got to them first! They made me really happy so I decided to have them again today with coucous as Daddy can't eat it and he isn't here tonight! The only down side to this, is this afternoon BB and I are back at the hospital with an bit of further training to do with BB's insulin pump so we might be eating later than normal and the temptation to give into a takeaway will be higher! Top Ender decided today that we needed to have Gnocci for dinner this week, apparently BB and Tops have been talking about our last couple of times having had it and have decided they don't like a tomato bake but do like it with butter and herbs. I have to admit that they are right, it did taste better with just the butter and the herbs. I thought I'd serve it with an Alfredo or carbonara sauce, but I'll let the children decide. I've been craving broccoli rice for a few days, it's been on my mind since I dreamt about it (I have no idea why either) and I thought it would go well with the Salmon, which we're having because I was talking to myself about the benefits I've got from blogging and my family eating more fish was one of them. Daddy found some gluten free crumbed Chicken in M&S the other day and so we decided to have it tonight, when he gets home from work. I'm teaming it with green beans, creamy mashed potato and carrots.